By default, Zaps will run every time new data is found to match your Trigger. 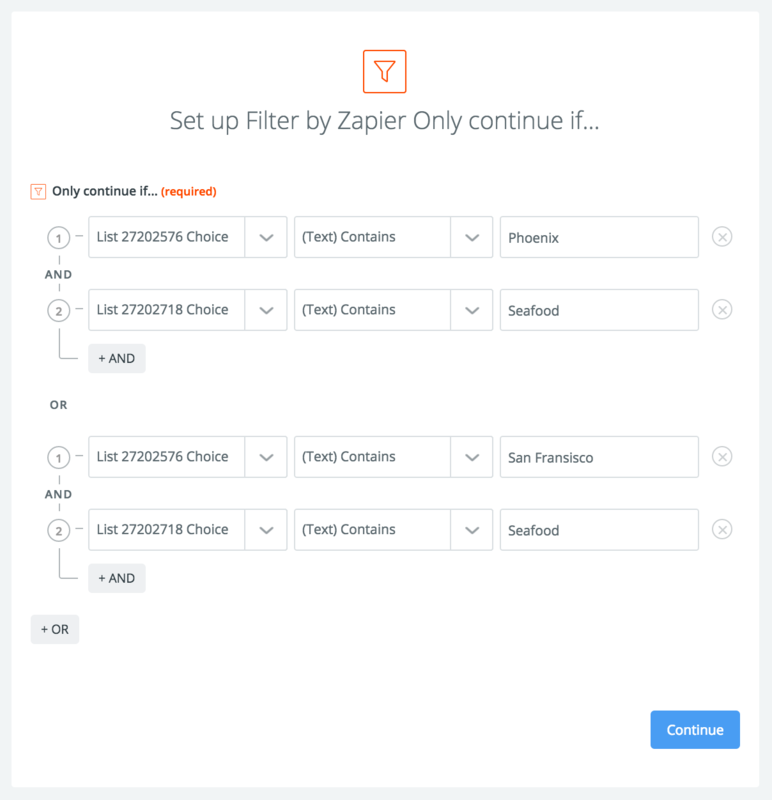 Insert a Filter step into your Zap, and you can tell the Zap to run only if your data matches certain criteria. Take control over your Zaps by telling it the rules on when to run. Filters can be added to any Zap to restrict it to run only when your conditions are met. This is especially useful when you want to add people that buy a product to a specific marketing list, notify your team on Slack when a customer feedback rating comes back as negative, or save emails that contain the word "receipt" to Dropbox. Filters essentially work as traffic signals, allowing you to route or stop Zaps different ways based on specific conditions. Filters can be easily added to any Zap. Step 1: After you have added a Trigger to your Zap, click on the plus sign in the left-hand menu where you want to add the Filter. Then click "Save + Continue" to configure your Filter. Step 2: Click on the dropdown menu to tell the Zap which field or fields to watch. When you select the dropdown, you'll see all the available fields from the Trigger step. For example, date, ID, or location, depending on the app data. Step 3: Once you have selected your field, choose the filtering option that best suits your need. Zapier supports text, number, date/time, boolean (yes/no), and does/does not exist. Step 4: Optional: You may want to add multiple criteria to your Filter to further refine your results. 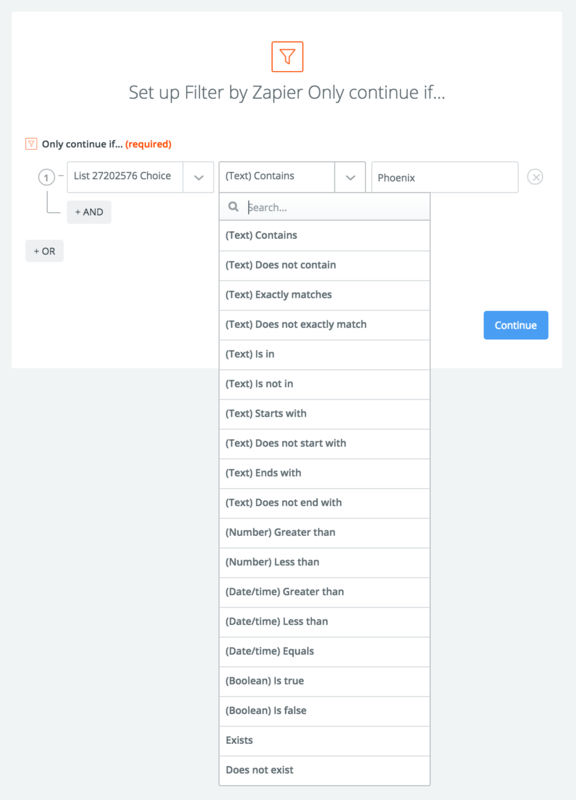 The "And" option allows you to further refine your search (as shown below), while the "Or" option expands your criteria to include additional results that will trigger your Zap. Step 5: Click "Continue" once you have finished adding your criteria to see the logic at work, determining if the test data in the Filter will trigger your Zap. In the example below, you will see the color coding with green indicating the logic would trigger the Zap and yellow indicating the logic that would keep the Zap from triggering. In this case, due to the criteria, the Zap will not run. Step 6: Save your Filter by clicking "Continue", testing it to ensure that it's working the way you need. Now you are ready to add your Action that will now only run when your criteria are met. 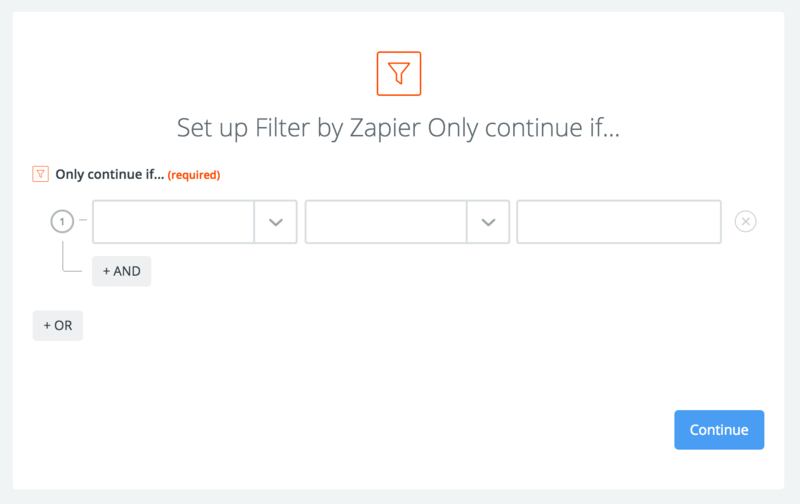 Feel free to add Filters to any of your favorite Zaps to create the perfect workflow. Zaps can help you automatically add new subscribers to MailChimp or other email marketing apps. Add a Filter to ensure only users who checked "subscribe to emails" in your form will be added to your list and help you stay compliant with email regulations. A Zap with filters is especially helpful if your team shares a lead pool. You can filter leads with custom criteria whenever they get added to Google Sheets, Pipedrive, or other CRM. Then, send yourself a notification when a qualified lead is found saving you valuable time and resources. Use Zaps to help you identify opportunities in your funnel. For example, you can keep track of influencers who follow your Twitter account by getting a notification when a new follower has more than 5,000 followings.